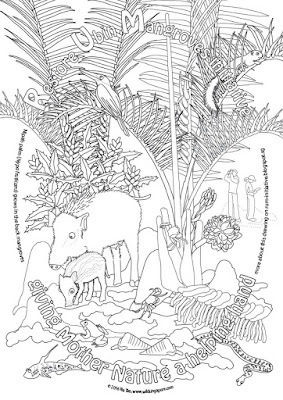 Specially for Pesta Ubin 2016, the RUMblers are offering these colouring sheets. 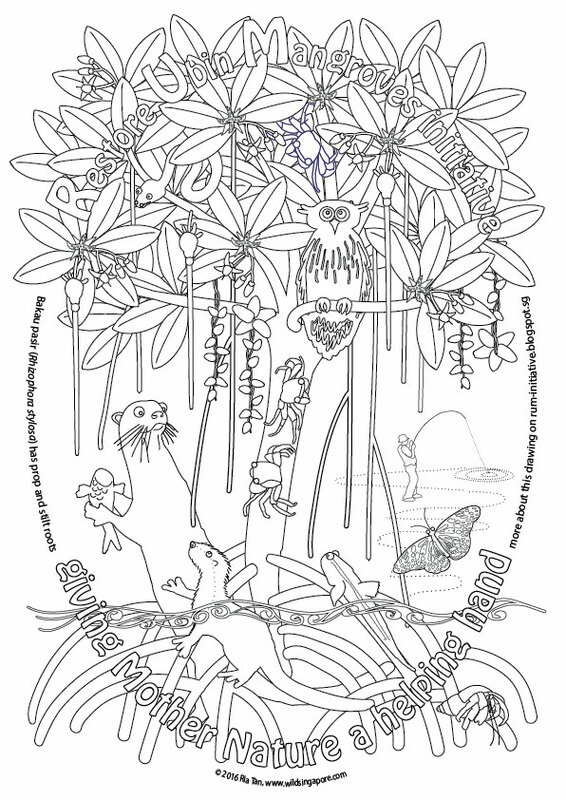 Have fun and learn more about Ubin mangroves and how you CAN make a difference to restore them. To get your copies of these colouring sheets, come visit RUM on 4 Jun (Sat) at the Assembly Area, Ubin Town; or on 5 Jun (Sun) at Chek Jawa. The Perepat tree has conical breathing roots and fluffy flowers that bloom at night. These are pollinated by the nectar-feeding bat. These same bats pollinate our durian trees. But durians only bloom once a year, so it is mangrove trees like the Perepat that sustains a population of bats that is so important for a good supply of Durians! The tree shelters a mama Long-tailed macaque and her baby. 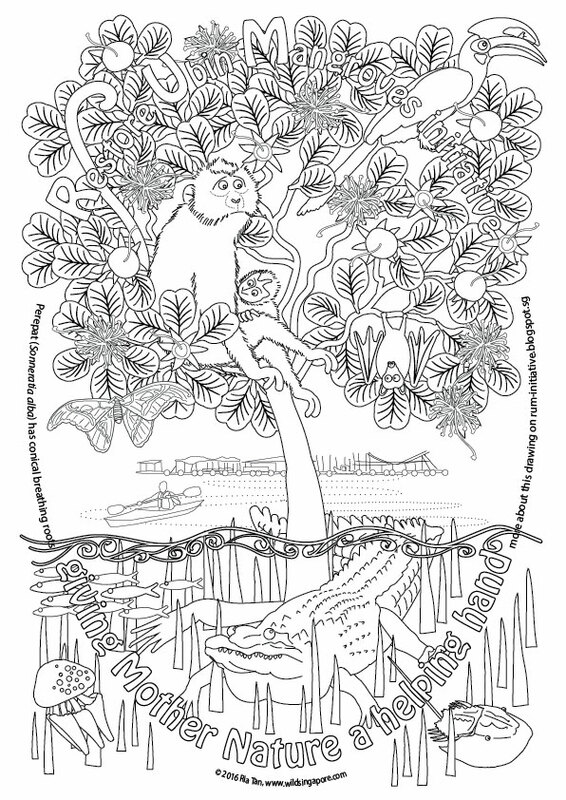 Also called a Crab-eating macaque, mangroves are among her preferred habitats. There is also an Oriental pied-hornbill and an Atlas moth in the tree. Under the tree, an Estuarine crocodile, a Mangrove horseshoe crab, a Mangrove jellyfish and lots of little fishes. Mangroves provide good water quality that is important to fish farming, water sports and others who live, work and play in the surrounding waters. Api-api putih is a common mangrove tree. It can be identified by its pencil roots. In this drawing, a Grey heron roosts in the tree. As well as a mama Common palm civet and her babies. 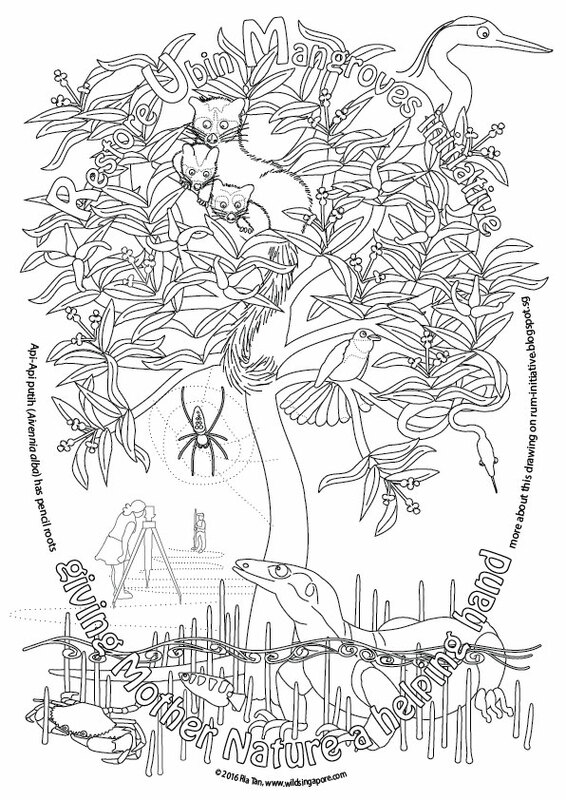 Also an Oriental whip snake, a Pied fantail and a Golden Orb Web spider. In the water beneath, there is a Malayan water monitor lizard, an Archerfish and a Mud crab (of Chilli Crab fame). In the distance is a pair of hardworking people taking measurements of the elevation of the mangroves. Here's more about why elevation is important if we want to encourage mangroves to naturally establish in the abandoned aquaculture ponds of Pulau Ubin. Bakau pasir is not very common in Singapore. It has stylish looping stilt roots and a curtain of drooping prop roots. 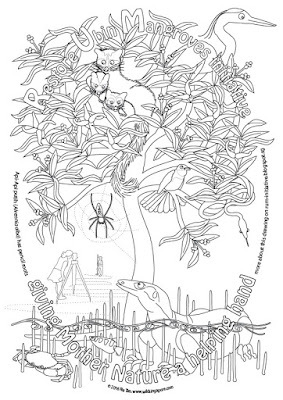 Growing among its branches is the Ant-house plant, while Tree-climbing crabs clamber in the tree. A Buffy fish owl and a Shore pit viper shelter in the tree too. In the water, mama Smooth-coated otter and her baby are eating a fish. While a Giant mudskipper and Land hermit crab rests among its roots. A Blue Glassy Tiger butterfly flits about. 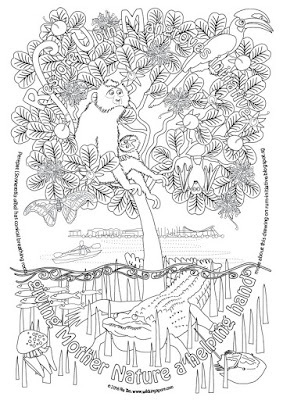 Mangroves are a nursery for many marine creatures including the gamefish prized by recreational fishermen. The Nipah palm is beloved for the 'attap-chee' that is found in our favourite desserts. It is found in the back mangroves where other plants such as the Sea holly flourish. Often growing among Mud lobster mounds which provides shelter for animals such as Tree-climbing crabs, Blue spotted mudskipper, Dog-faced water snake, Crab-eating frog and Telescopium snails. The Wild boar and her baby also forage in the back mangroves, while the Plantain squirrel and Collared kingfisher may be found among the tall palm leaves. In the distance, people are surveying the birds, trees and other wildlife of the mangroves. An important step to understanding how to encourage mangroves to naturally establish in the abandoned aquaculture ponds of Pulau Ubin. 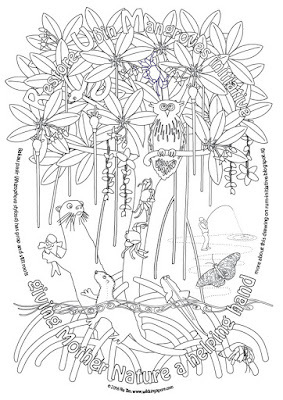 Hope you have enjoyed the colouring sheets!